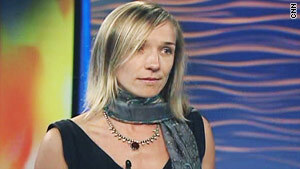 Ludmila Yamalova says she and her companion were surrounded by 10 gunmen before being kidnapped. Says "we were just in the wrong place at the wrong time"
(CNN) -- An American woman who was kidnapped, then freed, in Yemen last week recounted the experience Sunday, telling CNN she and her companion had taken adequate safety precautions and knew the risks. "I think we were just in the wrong place at the wrong time, to be honest with you," said Ludmila Yamalova. The area where she was kidnapped, she said, was not a known terrorist stronghold and there hadn't been reports of abductions there before. Yamalova, a San Francisco, California, native who lives in Dubai, said she had previously been to Yemen after hearing "wonderful things" about it from others. While she knew it could be dangerous, she said she also knew that tourists needed to take precautions. She and her partner, Glen Davis, "had all the permits in place," she said. "We had tourist visas with us. We were well-equipped." The two were staying in a hotel "off the beaten path" and had two professional guides, she said. When abducted, they were going to an area where one of the guides was from to eat with the guide's family. The group had stopped by the side of a highway overlooking a deep valley, she said, and she had taken some pictures. They were getting back into the car when a truck of about 10 gunmen pulled up behind them. Gunmen yanked out their driver and one of the guides, she said, getting into the front seat. She said she had had the window rolled down, and immediately locked her door and started rolling up the window, but "at that point, when you've got 10 men surrounding you with guns, I mean, there's absolutely nothing you can do." "You go in a very different mode," Yamalova said. "Some other part of you kicks in where I wasn't scared. I wasn't panicky. I certainly wasn't crying. For the first half hour, you're sort of frozen, taking one minute at a time, thinking, 'It's not happening. It's going to end, it's going to end.'" It was after the kidnappers turned off the road into more rugged terrain and began traveling down into the valley that "the fear kicked in (of) physical violence, because you have no idea what's going on," she said. She said she didn't know the two were being released May 25 when they were called down from the "castle" where they had been locked in for two days. "We knew there was something going on," she said. The two were met by a crowd of people and cameras, "but still at that point, you have no idea," she said. "You're kind of going along, hoping this is it." But Yamalova said she did not realize she had reached safety until the two Americans reached the Ministry of Interior in the Yemeni capital of Sanaa, and were greeted by U.S. officials.